The Grand Cru appellation was firstly established in Alsace in 1982 after a first test in the last 70’s. 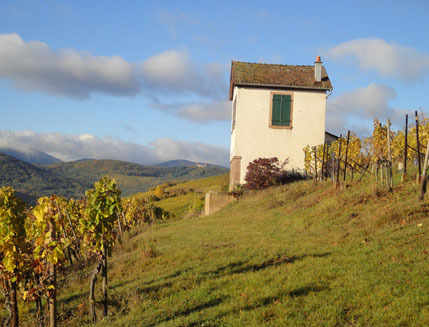 This appellation recognises in Alsace the most exceptional terroirs, which impart to the wines an expressive character and a unique authenticity. Now you can find 51 different Grand Cru in Alsace. They represent approx 5 to 7 % of the alsacian wines production. On a geological point of view, the Kirchberg is made of different lays of Mid Jurassic limestones and marls topped by Tertiary conglomerate. The soil is a calcareous marl with a stony texture and a good permeability. From this area we produce three different wines : Riesling, Pinot Gris and Gewurztraminer Kirchberg. These wines all reveal great nobility. They develop delicate mineral and fruit flavours which are characteristic of calcareous soils of the area. All three wines age very well. In the best year, when the climate allows a good start of noble rote on the grapes, we also produce “Vendanges Tardives (late harvest wines)” with these three varieties growing on the best place of the Kirchberg. These wines are full-bodied and contain more natural residual sugar.